Corporal Jason Root enlisted in Company "I", 4th Wisconsin Volunteer Cavalry on December 29, 1863 at Tomah, Monroe County, Wisconsin. He was recruited by Sergt D.A. Kenyon and enlisted for 3 years. He was mustered January 20, 1864 at Madison, Wisconsin. He was 18 years old, single, had hazel eyes, sandy hair, a light complexion, was 5' 5" and was a Farmer. He was from Tomah, Wisconsin. 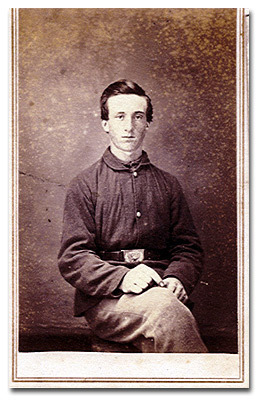 He arrived as a "recruit from Depot" on February 27, 1864 at Baton Rouge, Louisiana. In July, 1864 he was detached for duty at Colonel Davis' headquarters. On August 23,1865 he was transferred to Company "A". From November, 1865 to February, 1866 he was with the Post Commissary. He was promoted to Corporal sometime in 1866 and was mustered out with his Company on May 28, 1866.